Well Happy New Year everyone, Sorry that I am so late with my start, but New Years day my family was struck with one of the worst flu's I can remember ever having. If that was not excuse enough, when I woke of from my fever stupor, my computer simply would not turn on, uh oh..........for the cherry on top my tech guy is out of town for another two days :0 So seeing as today is the first day that I am feeling human, I am attempting to blog from my husbands old lap top, this thing is really busted up so please forgive me, I will be having technical difficulties for the next week or so while I get things up and running again. In the mean time I wanted to share my latest with you, I will be teaching a class down in Parksville this Febuary at Scrapbookin Adventures. 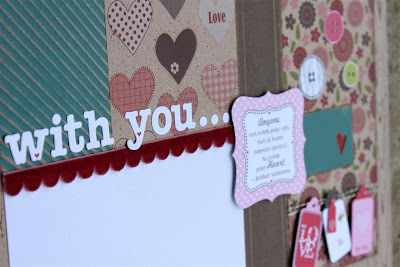 This class features Jillibean soups brand new hearty barley collection and some gorgeous new Core'dinations colors too!! We are going to do a double page layout and 2 single layouts and here's a little sneaky peak. Be sure to check it out here ,there is a bit more of a peek. I would love to have you join me if you can, it is gonna be a lot of fun with a TON of product and some great tips on how to make it do more for you. Happy New Year! Sorry to hear that you've had the flu. I hope you feel better! Cute sneek peek! Glad to hear you are starting to feel human again - good luck on the computer - nothing more aggravating than to have your computer down!